The KONG Squeezz Ball is made of special thermo-elastic rubber material that produces an unpredictable, erratic bounce to stimulate your dog’s natural instinct to chase. It has a uniquely designed, recessed and protected squeaker to help owners get and hold their dogs attention and to add to the fun of playing with Squeezz. Comes in three vibrant colours. 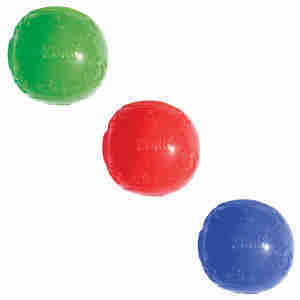 I wrote a review earlier saying that 3 squeaky balls had survived out of the 5 that I bought. I want to correct that because 4 out of the 5 have survived despite being in constant play with my 5 boisterous lot. My mistake. My 5 dogs love these and 3 out of the 5 are still intact. They're not totally dog-proof but they are the best yet and I will definitely buy again. Both my dogs really love these balls and they are the only toy that my puppy has not been able to completely destroy. Great value for money. My dog loves these balls. They are good value for money and last well - they get lost rather than wearing out! & Only criticism is you can't choose your ball colours, but do understand why. My dog loves these squeaky balls, and, unlike other balls, these last!